To create the Rain Maker I started with a series of sketches. We wanted something that looked complicated, but also allowed for travel to and from the filming sites. (The most hair-raising of which was stuffing the Rain Maker in the trunk of a van, driving to the park, and then hauling it out into the middle of a field.) The base is just two wrapping paper tubes and some large cardboard boxes. 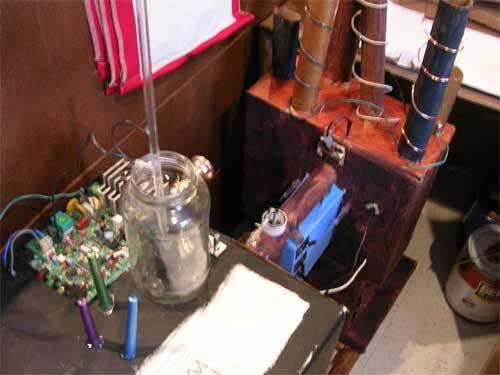 Once that was in place I stuck on whatever odds and ends we had laying around. Pieces of old pens, telephone wire, beads, a keypad from a really early movie, Dixie-cup dials, paper towel tubes, and an old circuit board. I think there was even part of an old bell and one of those plastic rods you use to turn the window blinds. Then, of course, we had to put the gag items on it. One of which is a keypad with Roman Numerals instead of numbers. Another is a dial that ranges from “Light Mist” to “Typhoon”. Our special effects department then added a little (logically explained and non-magical) movie magic to bring the machine to life. Hey Presto! Fonsugar’s Bane. 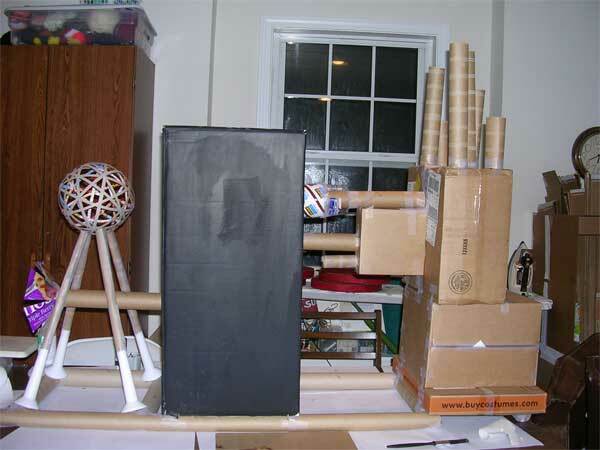 This entry was posted in Blog, Movies, Props and Costumes and tagged cardboard, dixie cup, isundae-ii-behind-the-scenes, odds and ends, paper tubes, plastic rods, weather, weather machine, wrapping paper. Bookmark the permalink. Impressive. What did you do with it after filming? [Smiles] I used to film using LEGO bricks and stop-motion animation. Using that medium, every prop is recyclable because it is a mixture of bricks.